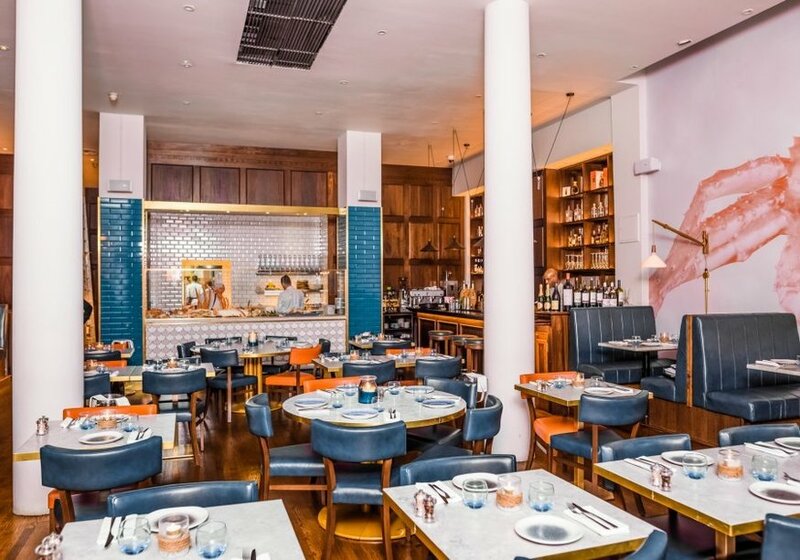 Alright, there's really no such thing as doing a Marylebone seafood restaurant on the cheap. But the numbers aren't stacking up that badly at Fancy Crab's new bottomless brunch. And on the food front? The dishes on the brunch menu aren't cheap, but they aren't credit-card-melting either. 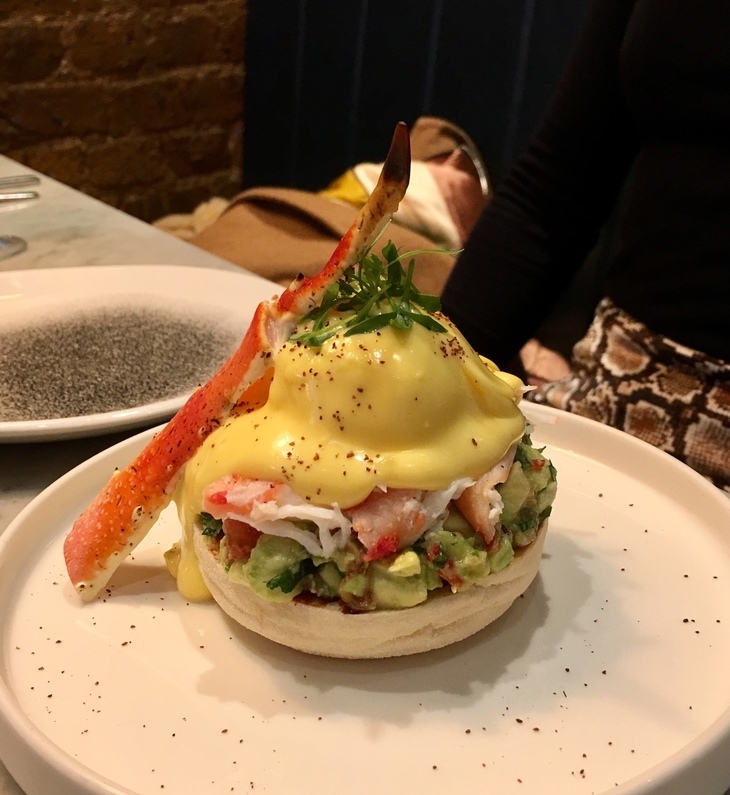 Everything's between £7.50 and £14.50, and if the King Crab Benedict (£13.50) is anything to go by, deliver a lot of flamboyant heft for your buck: avocado and crabmeat both stacked so thickly they still punch through the blanket of hollandaise. The catch is that the brunch menu's cheaper. But the main menu's... crabbier. More choice, more swagger, and more crab. Where the brunch menu's a handful of usual suspects (omelette, avocado toast, pancakes...), with only a couple of them featuring crab, the main menu's an OTT extravaganza of all things crab and all things... alright, fancy. It's often a very eighties brand of fancy: seafood cocktail overflowing from a martini glass, muscular langoustines hanging over the edge. Crab burger, a claw skewered through the bun with infinite menace, like an alien bursting out of John Hurt's chest. A lemon meringue tart ornate with garnishes, whorls, crumbs and coulis, proving that it's not just the crab that's fancy here. And this part of it doesn't come cheap. The burger with a side of truffle fries will set you back a thunking £28. It's good though, butter-rich bun leaking silk-thin pickle slices and creamy, delicate meat, so despite the price difference it's going to be tempting to stray off-brunch. Waiters wander the floor at a ratio of about one server per punter, being radiantly nice — apparently fancy doesn't equal snooty after all. Dishes are ferried out of the open kitchen bristling with claws poking out of unexpected places. The portraits lining the walls feature crabs jammed insouciantly into Renaissance artworks. It's utterly ridiculous, and also quite disarming: a bit like Fancy Crab. Fancy Crab, 92 Wigmore Street, W1U 3RD. Bottomless brunch runs Saturday - Sunday from 12 pm - 5 pm. Bottomless prosecco is £15 a head for 1.5 hours.